SAN MATEO, CALIF. (Dec. 4, 2015) – GoPro, Inc. (NASDAQ:GPRO) is making it easier than ever to self-capture and share ‘wow’ footage of your favorite activities with the newly priced $199 HERO4 Session. GoPro’s smallest and most convenient camera, HERO4 Session is about the size an ice-cube, weighs only 2.6 ounces and features a simple one-button, waterproof design that can go where no smartphone can. Wearable and gear-mountable, Session is compatible with GoPro’s expansive array of more than 30 accessories including helmet, chest, board, bike, gear and pole mounts. HERO4 Session is Bluetooth and WiFi enabled and captures professional quality wide-angle 1080p60 video and 8MP photos. 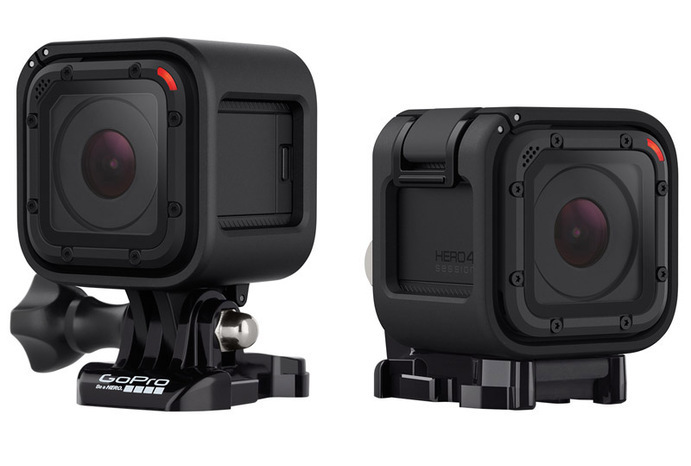 HERO4 Session users will enjoy its small, lightweight design and simple one-button control. Waterproof to 33 feet (10m), Session doesn’t require a separate waterhousing which means it’s always ready for adventure and captures crisp, clear audio even when used during snow and waterpsports. Built-in Bluetooth and WiFi enables easy connectivity to the GoPro App, allowing you to use your smartphone to view, edit and share content from your GoPro to social media sites such as Instagram, Facebook, YouTube, Twitter and more. The $199 HERO4 Session rounds out an exciting GoPro lineup including the industry leading $499 HERO4 Black and $399 HERO4 Silver.